Bridgetown has officially crossed over into the realm of cannabis industry stardom. Portland, along with the rest of the Pacific Northwest, has been at the forefront of medical and recreational cannabis legalization and is a major player in normalizing adult marijuana use. As the job market becomes more inclusive, with more offerings in the way of sustainable career paths, everyone is asking how to get a job in the Portland marijuana industry. Below, I’ve compiled a list of recommended steps to consider when pursuing marijuana industry careers — what you need to know and how to use it to your advantage. Cannabis is currently one of the most competitive industries in Portland, especially for entry level and customer service jobs. Individuals who work as bartenders, baristas, or other sales positions are seeking jobs in Portland’s cannabusiness as an avenue to pursue their interest in weed, benefit from the novelty of the industry, or both. Knowing cannabis means more than just smoking marijuana flower. In fact, it doesn’t really matter if you’re a major pothead if you don’t actually know anything about the substance, or care about its applications. Especially if you plan on working a job that deals with hands-on marijuana contact, you must be well versed in the many variations between a wide spectrum of cannabis strains and products. It’s not enough to know about Blue Dream and Sour Diesel — marijuana industry workers have a vast knowledge spanning the different cannabinoids present in marijuana, such as THC, CBD, terpenes and their many medical implications. It’s also beneficial to nourish a proficiency in cultivation practices — the different ways cannabis can be grown and the factors that influence successful growth. If you hope to work directly in cultivation, I’d suggest taking a look at some serious cannabis growing and horticulture journals and publications. When looking at how to get a job in the Portland marijuana industry, it definitely helps to have previous marijuana industry experience. Employers give serious consideration to applicants with proven, successful backgrounds working with weed. When working any job in Portland’s legal marijuana industry, consistently complying with any and all Oregon and city-specific cannabis laws and regulations is absolutely essential. Failure to comply with laws can and has resulted in individual and company fines, with the possibility of jail time. To reiterate, compliance is no joke. Before you even send an application in, visit Oregon.gov and Norml.org to be as up-to-date and informed as possible on local cannabis legislation. The laws are always changing, and employers are looking for passionate, active individuals who are current weed culture. Step #2: Get Yourself Out There! Depending on where you live and who you know, the following information will appear either encouraging or frustrating: personal connections have major stock in acquiring marijuana jobs. For the industry insider, this may mean you will never have to fill out an application or submit a resume to find a great job in the cannabusiness. On the other hand, those with no connections may apply time and time again to no avail. This is by no means to say that you must know someone to get a job in the industry — it just might be more difficult to establish credibility and get yourself in for the all important interview. So, how do you market yourself in such a way that facilitates relationships with industry professionals? A key thing to consider is your neighborhood marijuana dispensary. If you already frequent a pot shop regularly, one of the best things to do is get friendly with your local budtenders and receptionists. These experienced, knowledgeable folks can offer you their success-based suggestions for how to get a job in the Portland marijuana industry. Another way to establish connections is to participate in online forums, citywide meet up groups, or to blog about your personal experience on the job hunt. The cannabis industry can always benefit from unique voice and perspectives, to facilitate communication that can assist in the betterment of the industry for employers and candidates. Most people I talk to who are new to the Portland, Oregon marijuana industry, approach me about finding jobs in the cultivation or customer service sector, but the truth is: there are many other options for starting your career in the biz. Associated careers in the growing tourism sector of the cannabusiness, as well as marketing, writing and design are becoming increasingly viable options for getting your foot in the door. My advice is this: if you really want to find work in the marijuana industry, diversify your search. Look for openings in some of the lesser known fields of the business. Perhaps, the best course you can take is to draw upon your individual skills and applying your talents to marijuana. For instance, if you feel unqualified to work as a budtender or grower’s assistant, but have lots of experience in administration, consider applying to work as a dispensary receptionist or cashier. Below I will provide a look into some of Portland’s hottest marijuana jobs, offering a general job description in layman’s terms, to give you a better idea of what’s out there now. In all honesty, most of my coverage of this industry has focused on marijuana dispensary jobs, specifically in budtending. Budtenders effectively lead a diverse array of customers and medical patients through the process of selecting and purchasing cannabis products and paraphernalia. As mentioned earlier in this article, budtenders need to be well-versed not only in strain differences, but in determining a customer’s tolerance level and offering informed advice to engender the best consumption experience possible. Budtending is somewhat of an entry level position and is staunchly placed within the customer service sector of the industry. Young adults and other individuals who have worked consistently in customer service pursue this position, yet few are able to secure a position. One of the “gateway jobs” into becoming a budtender involves working as a receptionist and working your way up the ranks. Especially in Portland, it’s not an easy task to find full time work growing weed. Given the setup of the city and the laws prohibiting major grow operations, very few full time cultivation jobs can be found in the city itself. Growers lead and/or facilitate the process of cultivating a crop from germination to harvest and beyond. Grow operations are usually led by master growers, who have years of proven success in producing a healthy crop. Not only do they oversee the operation as a whole, they are responsible for creating an indoor/outdoor atmosphere that best facilitates cannabis growth. This includes different methods of soil and hydroponic growing, light and ventilation, pest control and more. So: How to get a job in the Portland marijuana industry in cultivation? If you do find work at a grow operation, it is likely that you will work as a bud trimmer. Trimmers remove excess plant matter from cannabis flowers by snipping fan and sugar leaves to optimize cannabinoid concentration and create attractive, tightly trimmed buds. Given that Portland is experiencing a dramatic increase in tech-related businesses and startups, developers and entrepreneurs have realized the financial potential of marijuana based websites, apps and other services. Founded in Irvine, CA and currently headquartered in Seattle, mammoth cannabis resource Leafly has shocked the world by asserting itself as an omnipresent service for finding medical and recreational marijuana dispensaries and educational resources. Now that marijuana is becoming more legal alongside a continuous boom in tech development, the two industries will surely work to prop each other up for their mutual benefit. The course of how to get a job in the Portland marijuana industry when it comes to entrepreneurship is largely a self-motivated one. Starting any business is a monumental task, not to mention creating a company that is already deeply shrouded in convoluted legislation. Step #4: Portland is Your Advantage! If you live in Portland, you are by default miles ahead of many other competitors across the country in finding a marijuana job. Portland is undoubtedly a hot spot for pot and offers many more opportunities per capita than most cities across the country (and the world). There is a widespread cannabis culture thriving in the City of Roses, including marijuana-friendly papers and publications, festivals and other sponsored events. There are plenty of like-minded individuals who would be happy to communicate with you about their experiences and advice in how to get a job in the Portland marijuana industry. Exceptional publications, such as the Portland Mercury and the Willamette Week consistently covering the changing marijuana job market and legislation therein. You basically can’t walk down the street without being exposed to some sort of dispensary, marijuana doctors office, advocacy group or head shop. 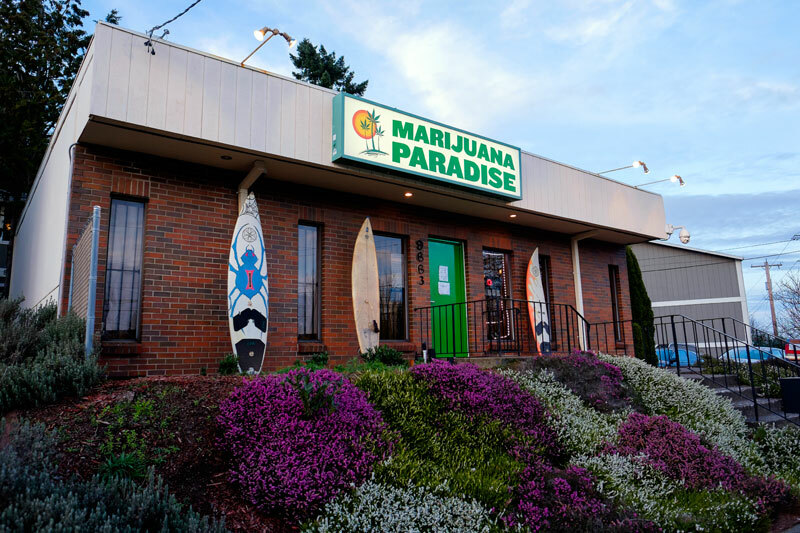 When the legal industry broke in Portland, it wasn’t long before associated industries jumped on the bandwagon to benefit from the increase in marijuana-based tourism. Everything from spas to lodging companies and rent-a-vape delivery companies have used their influence in travel and tourism to support and capitalize off the cannabis industry. Only one year after the sale of marijuana products became legal in Portland, Oregon has reported nearly 15 Million dollars in tax revenue, translating to about 60 million in sales. This trend will likely continue with exponential profits as more dispensaries and collectives continue to open. The above numbers largely represent sales in the city of Portland, as much of eastern Oregon does not participate in the cannabis industry. If this trend is any indication of the future of how to get a job in the Portland marijuana industry, it should act as an encouraging reminder that the industry is only just getting started.